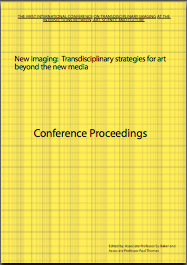 The first International Conference on Transdisciplinary Imaging at the Intersections between Art, Science and Culture. The conference is supported by nine prominent Australian art schools who have partnered together to focus on questions of the transdisciplinary image. Over two stimulating days acclaimed professionals including curators, historians, creative arts practitioners, media artists, critics and theorists explore transdisciplinary imaging. A profound shift is occurring in our understanding of postmodern media culture. Since the turn of the millennium the emphasis on mediation as technology and as aesthetic idiom, as opportunity for creative initiatives and for critique, has become increasingly normative and doctrinaire. Mediation and the new media arts have in fact become the new medium of critical and pedagogical discourse: like water is for fish, like culture is for cultural studies, mediation is a concept that is taken for granted now because it is itself the medium in which we think and act, in which we swim. We need a concept that is amphibian, and that can leave its medium. The concept we propose is a remediated apprehension of the image: an active image and activity of imaging beyond the boundaries of disciplinary definition, but also altering the relations of intermedia aesthetics and interdisciplinary pedagogy. This concept will need to incorporate a vibrant materialism of the image’s sensory and cognitive strata and an evanescent immaterialism of its affective qualities.